Tama's reputation suggests that it would never rush into a decision and a great deal of preparation has clearly taken place before the transferral of the production of one of its flagship lines to China. It has the looks, feel and sound of a fully-fledged pro kit - just like the more expensive kit it replaces. This kit bears all of Tama's hallmarks - solid build, quality components and careful detailing. Amazing sounds. At the end of last year Tama transferred the production of its Starclassic Bubinga and Starclassic Maple drum kits to China. With Starclassic Performer Bubinga/Birch already being made in China, only the series-topping Starclassic Bubinga Omni-Tune and Starclassic Bubinga Elite lines remain Japanese-manufactured. The five-piece shell pack sent for review was the first Chinese-made Starclassic Bubinga kit to enter the UK. 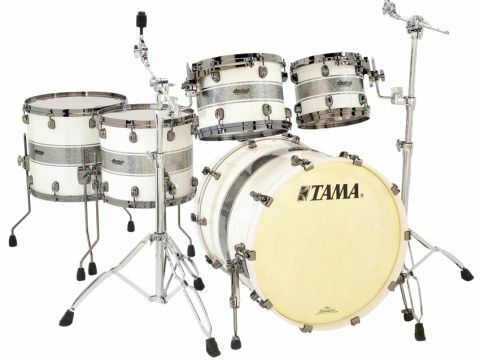 "Everyone who encountered the kit was impressed, and many of them didn't care where it was manufactured - they just liked the sound it made"
Tama has built its reputation on engineering prowess, design innovation and high quality end products. While China has become a destination of choice for countless manufacturers at lower price levels, production of high-end pro ranges such as the is less common. What lies behind the switch is the perennial need to keep costs down, and the price difference between this new Chinese-manufactured Starclassic Bubinga and an equivalent made-in-Japan Starclassic Elite tops £1200. The new Bubinga kit is also over £500 cheaper than the Japanese kit it replaces. With Starclassic Bubinga kits now being supplied as snareless shell packs, the five-piece review kit is made up of an undrilled 22"x20" bass drum, 10"x8" and 12"x9" rack toms and 14"x12" and 16"x14" floor toms. Two alternative shell packs are also available, while kits can be built from individual drums. With a single exception (the 18" floor tom), each diameter of drum can be supplied in at least two and as many as four different depths, including Tama's super-short Hyperdrive sizes. Immediately noticeable is the striking finish, one of nine new lacquer finishes for 2010. The Silver Snow Racing Stripe is absolutely stunning. Only one finish, Piano Black, has been kept on from the previous finish options. The shells are all-bubinga and are nine plies thick with the toms and floor toms coming in at 6mm while the bass drum is 7mm. Bubinga is an extremely dense wood - over 50 percent harder than maple and birch and so the drums are distinctly, although not uncomfortably, heavy. The bearing edges are cut at 45 degrees with a tiny amount of rounding off. One of bubinga's defining characteristics is precise attack so the rounding off is probably intended to add smoothness to the sound. Inside the shells the rich, tobacco-dark hues of the bubinga are complemented by black nuts and washers. The hoops are, like almost every piece of shell hardware on the kit, coated with black nickel. Available at no extra cost, the coating adds a smoky sheen to the kit's appearance. This kind of visual statement only works when applied uniformly and Tama is spot on here as the lugs, badge, tom suspension mounts, floor tom legs, bass drum spurs and even the tension rods all share the coating. The hoops also contain three extra eyes into which the Star-Cast suspension mounts are threaded. The beauty of this design is that the mounts are attached directly to the hoops, independently from the tension rods. Head changes are thus swiftly accomplished without the usual distraction of having to get the mounts, lugs and tension rods in alignment. As if to counter the weight of the bubinga shells and die-cast hoops, the Star-Cast mounts are made from aluminium, ensuring minimum gain. The huge claw hooks on the bass drum have rubber washers that Tama claims will prevent them from rattling loose, so preventing any damage to the wooden hoops. Extra protection comes in the form of the thick rubber gaskets that line the inside of the claws where they grip the hoop. The bass drum's spur mechanism resembles a precision instrument, with a series of evenly-spaced notches on each side, while the floor tom legs feature air chambers in the rubber feet in order to create a cushion that prevents vibrations from dissipating into the floor. Considering its prodigious length and undrilled shell, the bass drum was only ever going to give a deep and powerful response. The way it anchored every stroke, beat and accent was still nothing short of wonderful. Each touch of the pedal brought a thunderous wallop that planted itself at the heart of the proceedings. With no dampening it was surprisingly dry, no doubt an influence of Tama's calfskin-style front head. The sound was resonant, unstifled and yet controlled, and led into a perfectly-timed natural decay. The toms made equally good company, giving a showcase of the virtues for which bubinga is acclaimed - sharp, cleaving attack backed up by a profoundly fat note. It's as though any mid-frequencies have simply been removed, as they cut through effortlessly whilst at the same time sounding decadently rich. The fitted Evans G2 twin-ply batter heads would certainly help flesh out the sound and encourage deeper harmonics, but this would normally be at the expense of higher frequencies. The amount of attack on tap meant that even at lower tunings the toms still scythed through the backline. The die-cast hoops no doubt played a part, as they tend to instil a tightness in the sound. This was especially noticeable on the floor toms, where slackened heads can sometimes result in flabby rumblings. Here though, were terse knots of power delivered with uppercut speed.